I’ve been threatening to do this for a while. Pile up all the unread books I’ve got and take a photograph of them, just for giggles. So I did, and slightly scared myself. Clearly, I get far too much pocket money. 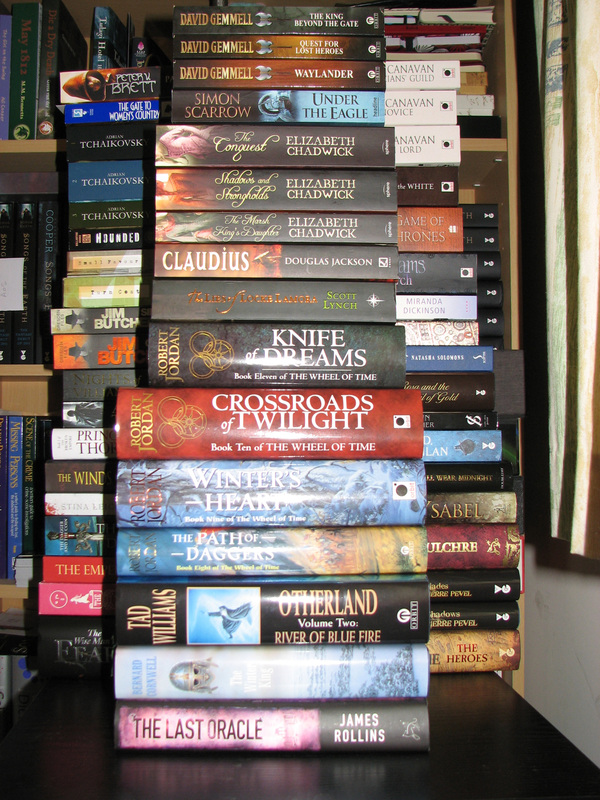 Here is Ellie’s to-be-read pile, in no kind of order, just how they came off the shelves. That’s over six feet four inches of books. Yes, I have just measured it; no, I do not think that is remotely sad. 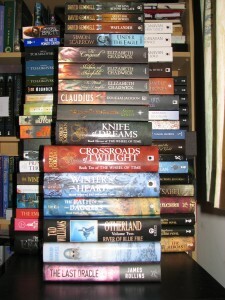 This mountain of words does include some books I was given as presents Quite Some Time Ago, and a couple of them I’ve started and put down for whatever reason (Tad Williams’ River of Blue Fire, I’m looking at you here – and Trudi Canavan’s Magician’s Guild, don’t think you can hide at the back). What it does not include is all the books I will have to re-read before I attempt to conclude various series, like the Dresden Files, and The Wheel of Time. What can I say, I have a terrible thing for completeness. Still, they do say that the first step in overcoming addiction is admitting you have a problem. To e-read, or not to e-read? I have been a strident advocate of real books, but Amazon’s relentless Christmas advertising campaign got to me, and convinced me that I needed a Kindle – even though I didn’t actually want one. Add that to my Christmas loot burning a hole in my pocket, and the result was inevitable. I have to say, it’s impressed me. Beautifully engineered, it is light, readable, vastly more portable than the chunky hardbacks in my library, great for train/plane/long stay in hospital. But it will not replace the paper book in my heart. Why? An e-reader doesn’t smell right or feel right and has no substance. Reading an ebook is just like reading a technical pdf (and I had quite enough of them in my last job, thank you very much). It’s utilitarian. It has no soul. And I can’t take it into the bath.